Construction is underway on a trio of townhouses on F Street, which will become affordable housing units. 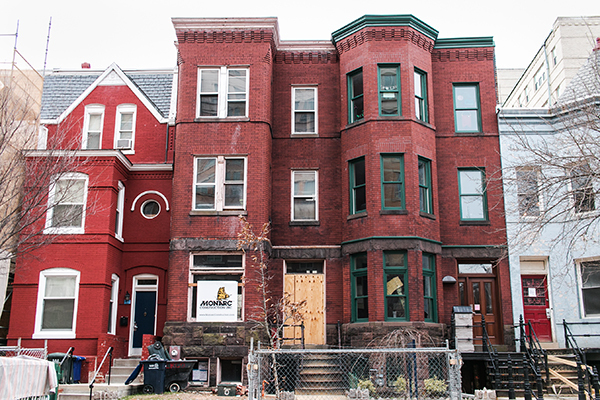 Construction workers are turning three empty townhouses on F Street into affordable housing. The interior demolition on the townhouses has been completed and workers have begun structural work on the townhouses, a University spokesman said. The project – which is next to FoBoGro – was planned in 2013 as part of an agreement with the city – in exchange, GW is able to renovate an 11-story office building on Pennsylvania Avenue. University spokesman Kurtis Hiatt said in an email that the project is expected to be completed this summer. He said the “long-vacant rowhouses” are being converted from single family units to one-, two- and three-bedroom rentals. He said the rentals will be available to residents who earn up to 80 percent of the average median income in D.C. The median income for the D.C. metropolitan area is more than $100,000 yearly, according to city statistics for 2015. Residents are considered eligible for subsidized housing if they earn less than $87,000 for a family of four. GW is spending $1 million on renovating the townhouses and will pay an additional $2 million to subsidize rent in the houses for a 30-year period. The units were agreed upon as part of GW’s larger construction plans because the Pennsylvania Avenue building required officials to expand the boundaries of campus by 40 feet, altering the 20-year campus plan that was set in 2007. The Pennsylvania Avenue building landed its first tenant, Cleary Gottlieb Steen & Hamilton LLP, last month. The units will be matched with residents through the District Housing and Community Development requirements, Hiatt said. “They will be marketed through DHCD’s Housing Locator website and made available through its lottery system,” he said. Hiatt also said that as part of the project, GW will pay $150,000 for streetscape improvements at the Pennsylvania Avenue site – upgraded sidewalks and lighting, tree box fencing and landscaping. This article appeared in the February 8, 2016 issue of the Hatchet.